I'm just so excited by the new Occasions Catalogue (Products available 4 January 2017 to 31 May 2017) - Stampin' Up! just keep surpassing themselves .... I don't know how they do it! I have always love dragonflies - so when I saw this bundle in the new catalogue - I had to buy it! 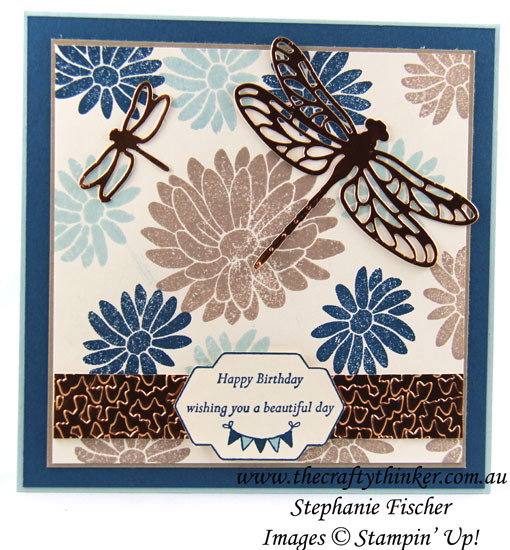 This card features beautiful flowers and sentiment from the Special Reason stamp set (P. 42 of the catalogue) combined with dragonflies cut from Copper Foil Sheet with the Detailed Dragonfly Thinlits Dies. The dragonflies are available as a bundle with the Dragonfly Dreams Stamp set - which is so gorgeous that it's well worth while buying the bundle and saving 10% in the process! 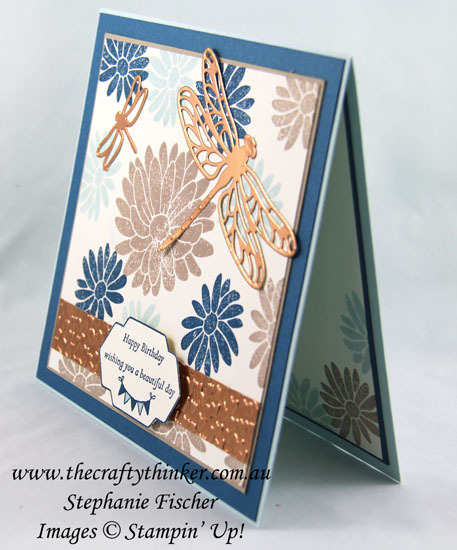 The strip of Copper Foil Sheet is embossed with the new Falling Petals embossing folder.